Hidden behind the ocean blue door, overshadowed by a large cactus plant, is a wonderful romantic and tranquil restaurant. One walks into a surprisingly large, open and airy stone courtyard with numerous plants, water features and trees scattered around the boarder. In the centre of the courtyard under a white, draping canopy, you will find the main seating area with elegantly laid wicker tables. As you walk to your left, you enter the veranda of the house where quiet, romantic tables are hidden in alcoves and beautiful pink Bougainvillea hovers above. Chef Pastis, renowned for his excellent cuisine, uses only the finest and freshest ingredients of the day to create the specialized menu. It can be viewed on a large chalkboard at the entrance of the restaurant. The menu, therefore, changes depending upon the season and the availability of produce. The menu's core dishes are fresh seafood but a variety of delicious meat dishes are also available. 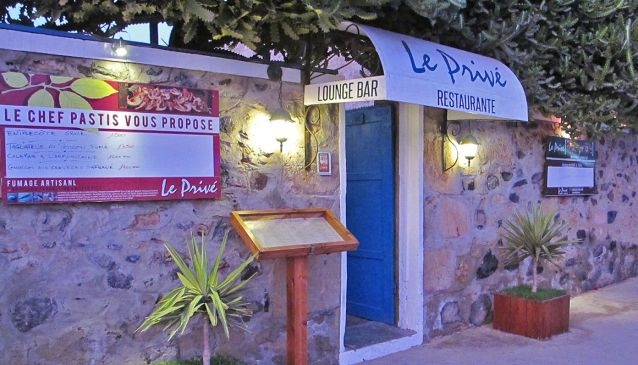 'Le Privé' is a restaurant and lounge bar that would be perfect for a special evening. Make it an occasion to pamper yourself during your stay in Cape Verde.